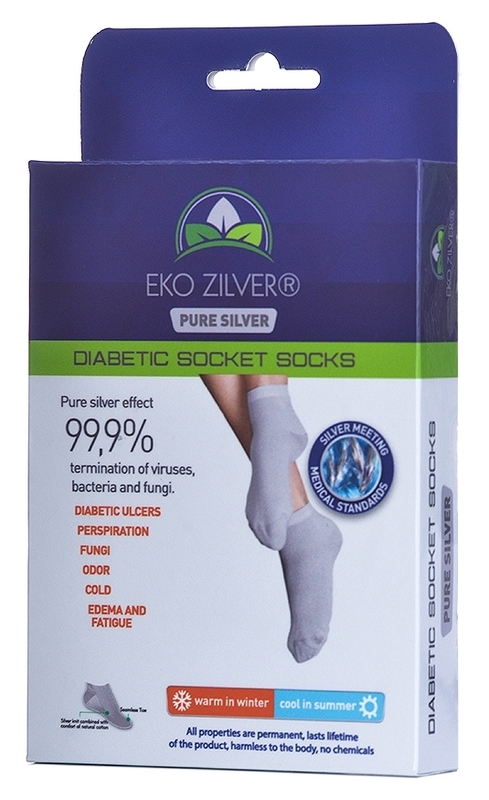 Medical Healthcare socks made with natural silver fibre, soft cotton and Polyamid. Good for treating Athlete’s Foot, Hyperhidrosis, sweaty feet, cold feet, Heavy Legs, Deep Vein Thrombosis (DVT). Suitable for Diabetics and Dermatitis patients. 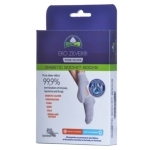 1 Special elastic band not pressuring the ankle, 2 silver knit upto above ankle level and 3 seamless toe closure. Protects your feet from infection. Prevents heat loss and keeps your feet warm. Has effects on revealing edema on your feet and ankle. 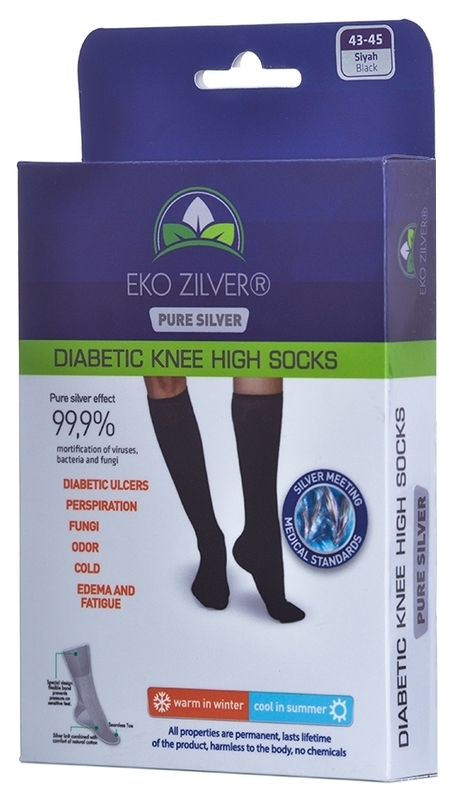 Has effects on relieving edema upto knee high level. 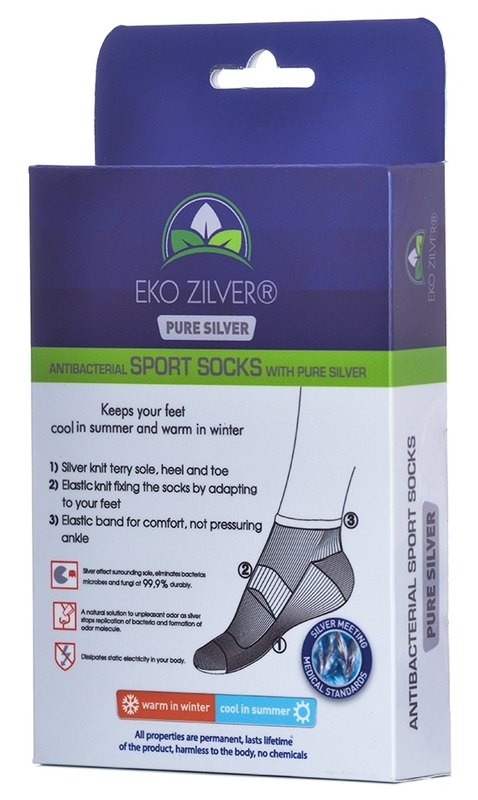 1 Silver content increases wicking keeps your feet dry cool in summer, inhibits formation of fungi and bad odor. Prevents heat loss and keeps your feet warm in winter. 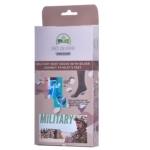 Protects your feet from growth of fungi and bad odor. 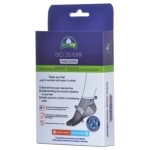 1 Terry knit protects your feet from impact and friction.Silver knit increases wicking keeps your feet dry and cool, prevents formation of fungi and unpleasant smell. 1 Terry knit protects your feet from impact and friction.Silver knit up to knee high level. 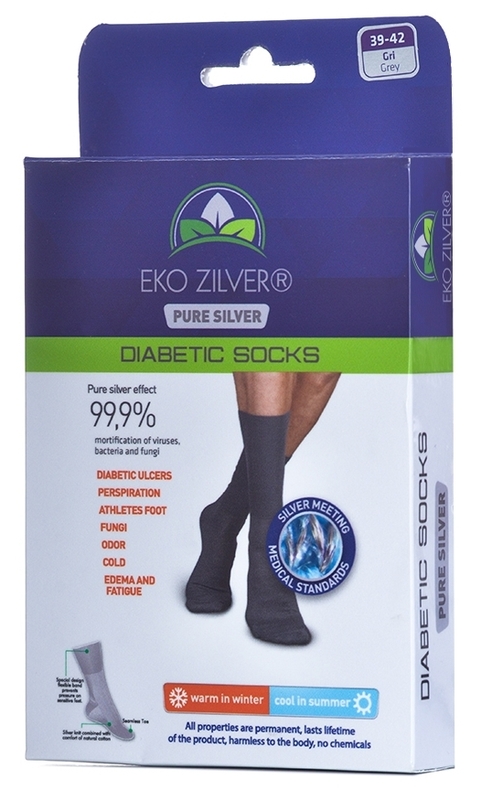 2 Silver knit increases wicking keeps your feet dry and cool, prevents formation of fungi and unpleasant smell. 3 Low pressure elastic band helps to overcome fatigue. 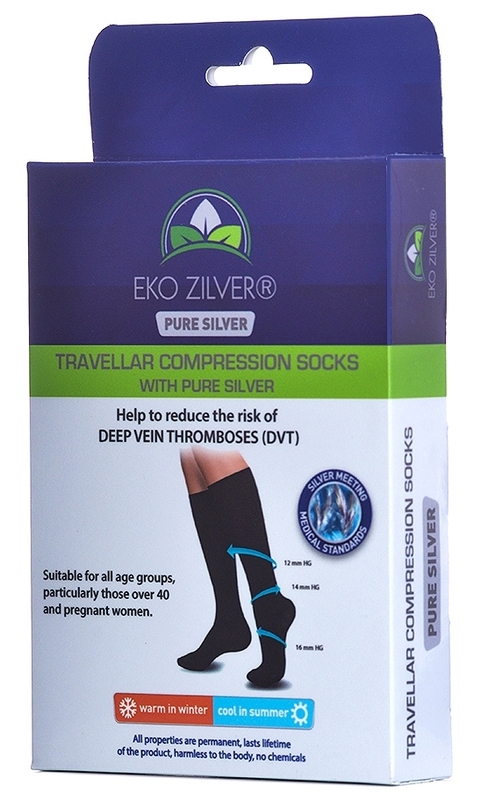 Silver knit up to knee high level combined with low pressure prevents swollen feet during your journey. Antistatic property dissipates triboelectric charges and prevents fatigue. Silver fibre technology utilizes a layer of pure silver fibre which is permanently and irreversibly bonded to the surface fibre and has been tested for 250 washes without any loss or compromising of medical performance. Silver fibre underwear garments are both comfortable to wear and enhanced by the smooth internal integrated seams. These garments are durable and suitable for everyday wear. For successful treatment we recommend a daily change. All the silver gloves, silver socks and products can be washed at 40°C with any similar colours and can be tumbled dried (gloves should be flat dried). The overall garment appearance and shape will remain intact throughout everyday washing and wearing. These natural silver products have for many years been used for medical purposes in Dermatology, Podiatry, Occupational and Travel Health Care. These products are recommended by Occupational Doctors, Dermatologists, Podiatrists and Pharmacists.